Happy almost weekend! Thursdays are my cleaning mornings and I’d like to procrastinate that very much and so, let me post a recipe. 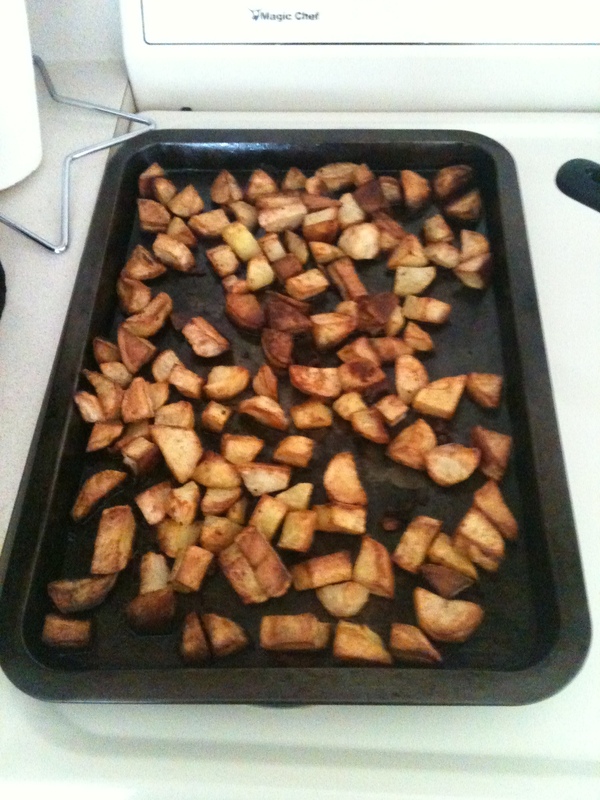 For whatever reason I’ve always been terrible at making potatoes. Their thickness and readiness to burn without cooking on the inside are a source of endless frustration for me. Ok, that may be a bit dramatic but it does annoy me. 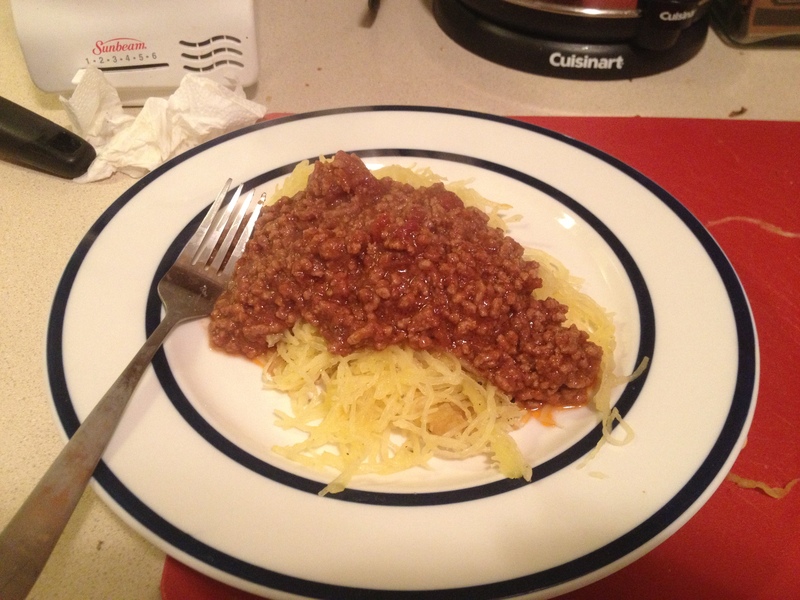 So I decided on Sunday that I would conquer the potato, and I did! Also, I made a huge batch of these so we could have them for lunch during the week. This is a great way to cut back on prep and cooking time when you don’t have any spare minutes during the week. Here are the ingredients but I can’t stress enough that if you don’t have everything, just improvise. 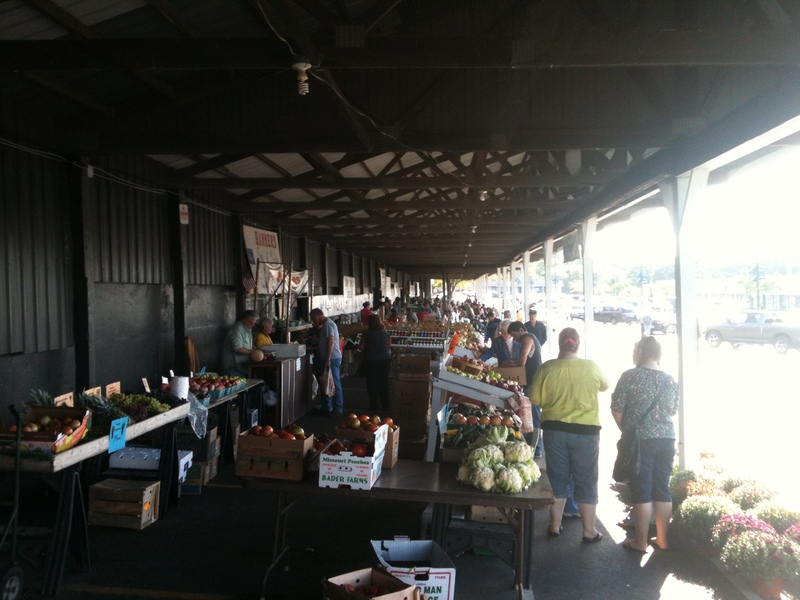 Smell the food then the spices you have and pick out which ones you think would go best. That’s why cooking is awesome, it’s based simply on your senses. Heat oven to 475°F. Get out a shallow baking pan. You don’t need to prep the pan (awesome!). 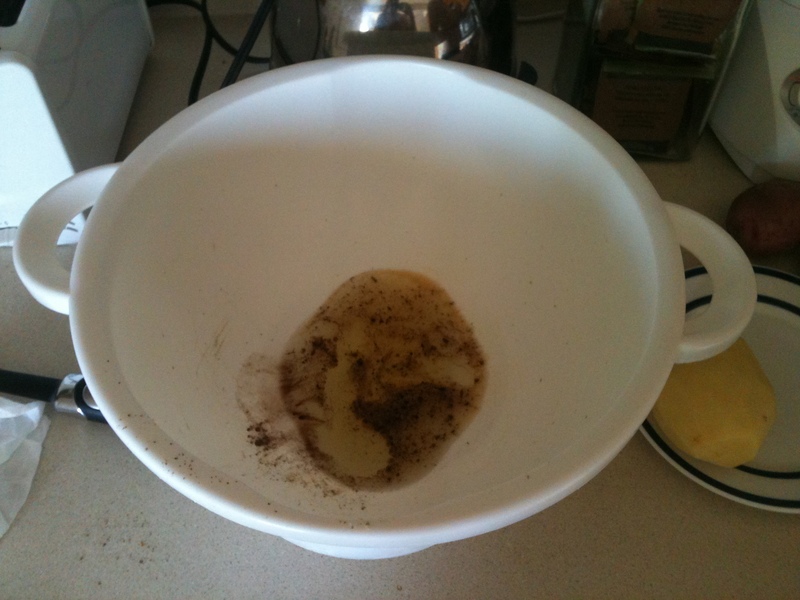 ^ Quickly mix the oil and all spices in a large bowl. 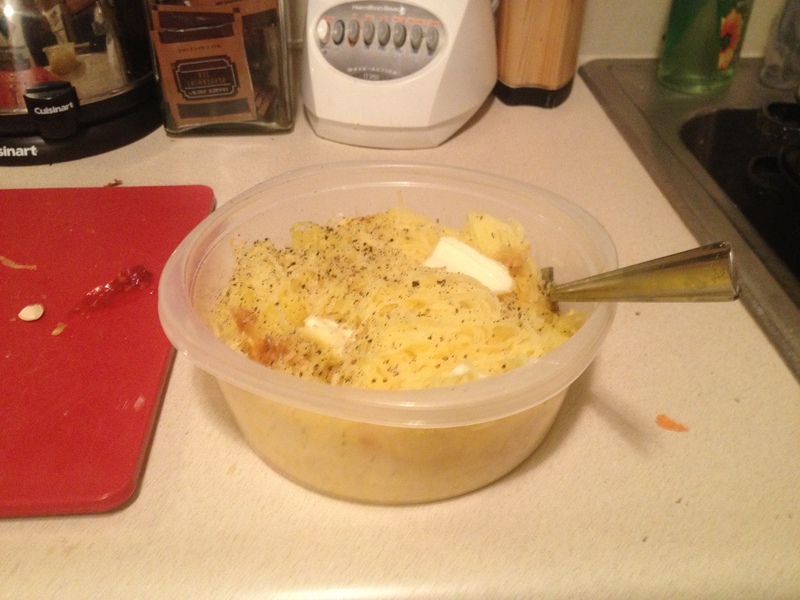 ^ Dump in cubed potatoes and mix it all with your hands. This is super messy, fun, and perfect to do with kids. 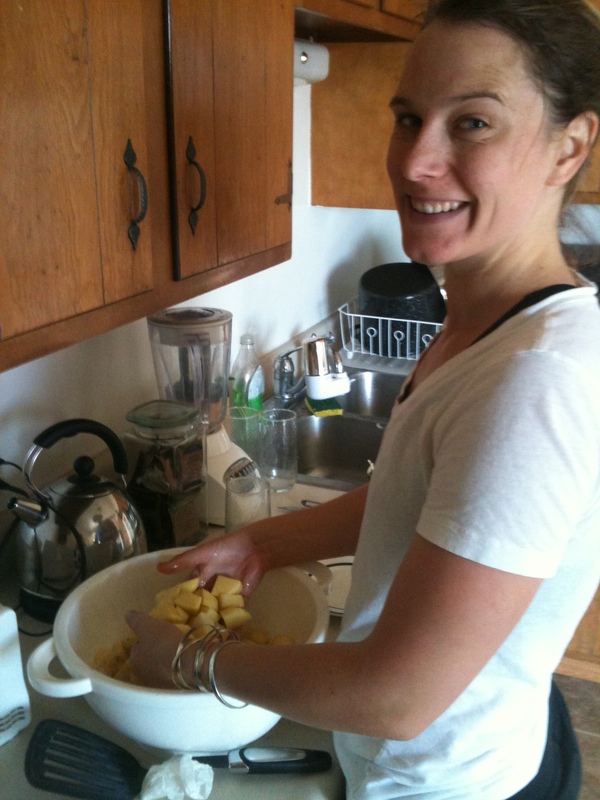 (I know I look skeezy in this photo but Mike took it and I didn’t want to test his patience, he was already helping me peel potatoes). 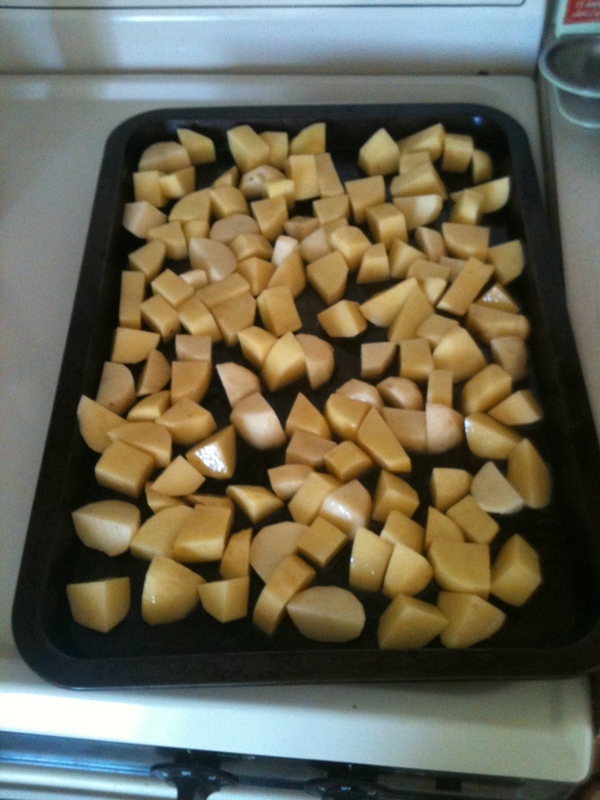 ^ Spread the potatoes on the baking sheet. 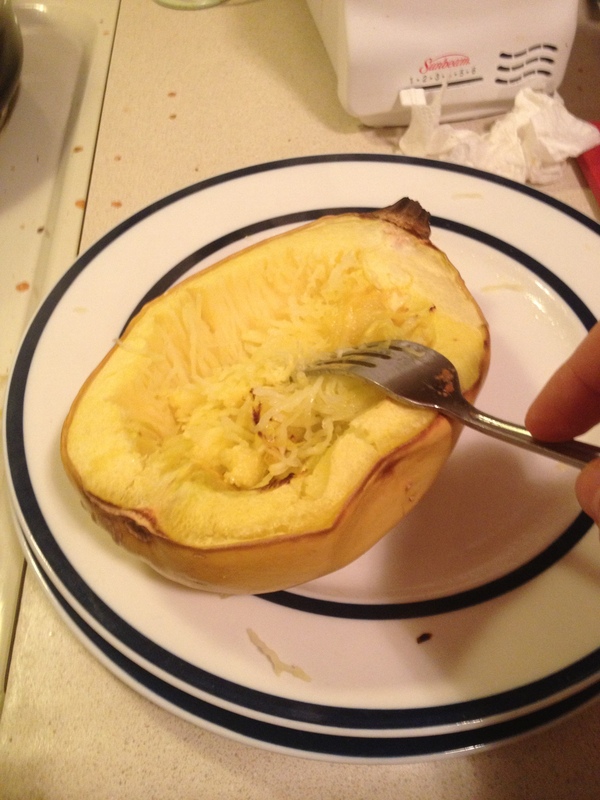 Slide it into the oven and cook for 20-30 minutes, turning occasionally to brown on both sides. ^ And this is the result! Ours were a bit too oily but still SO DELICIOUS. And so easy to make. *My mom makes the most incredible roast potatoes. Same recipe but she uses red potatoes, keeps the peel on, chops them in bigger chunks, and adds rosemary. Also, SO YUMMY. This entry was posted in Recipes and tagged celiacs, Cook, dairy free, gluten free, health, inspiration, nutrition, Potato, Potatoes, recipe on September 27, 2012 by ahappylass. As I last posted, I’ve been working the Morton Pumpkin Fest for the last several days. If any of you know of the festival, you know it’s full of some seriously delicious junk food; including but not limited to: pumpkin donuts, pumpkin pie, pumpkin ice cream, pumpkin funnel cake. Everything delicious, in pumpkin flavor!! It’s my own personal temptation hell. However, it’s so important to learn how to brave these situations and so that you can join the rest of your community celebrating awesome things like Fall! 1. 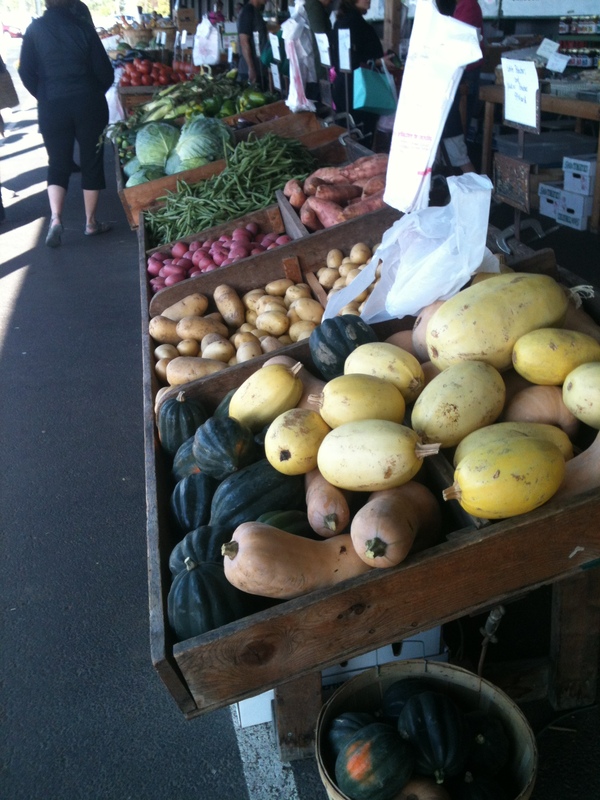 Choose one thing to treat yourself to and wait until the end of your trip to do it. The buildup will make sure you don’t violate your own rule. 2. Make sure, before you leave the house, that you eat a big, healthy meal. Being full means you’ll be less tempted by anything other than your planned treat. 3. Bring some snacks! This is where dinner leftovers make things quick and easy. – Sandwich – gluten-free bread, sunflower butter, and blackberry jam we found at the farmers market. – Smoothie – coconut water, 1 banana, handful of frozen fruit, handful spinach, scoop of protein. 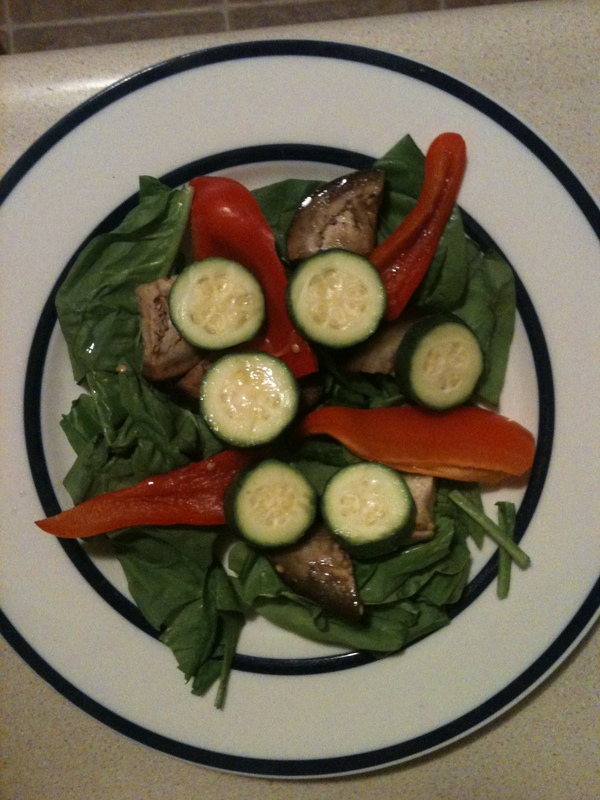 – Salad – whatever is in your fridge. Mine was tomatoes, spinach, pinto beans from the chili last week, and humus. 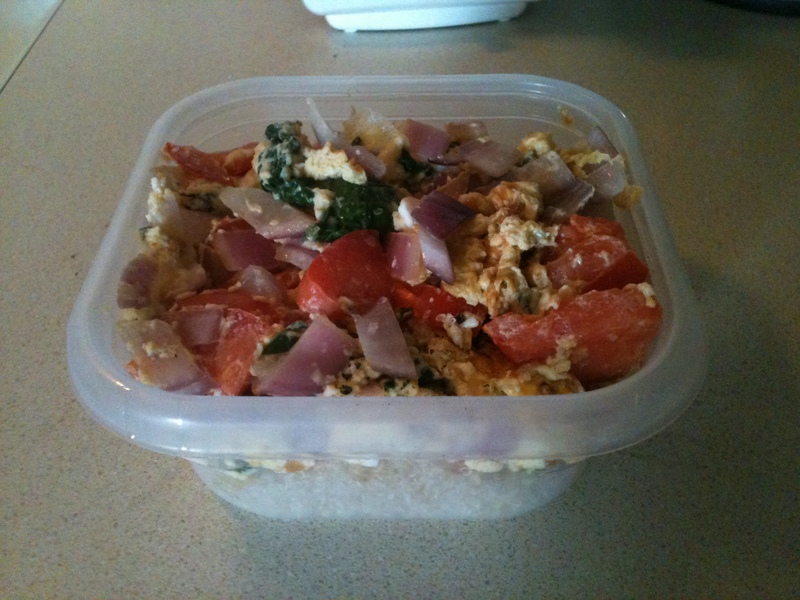 – Resealable container like a Tupperware. – Blender bottle for the smoothie. It’s not only easy to drink out of but it has a little spring ball that you keep in the liquid and when you’re ready to eat you just shake it all up. 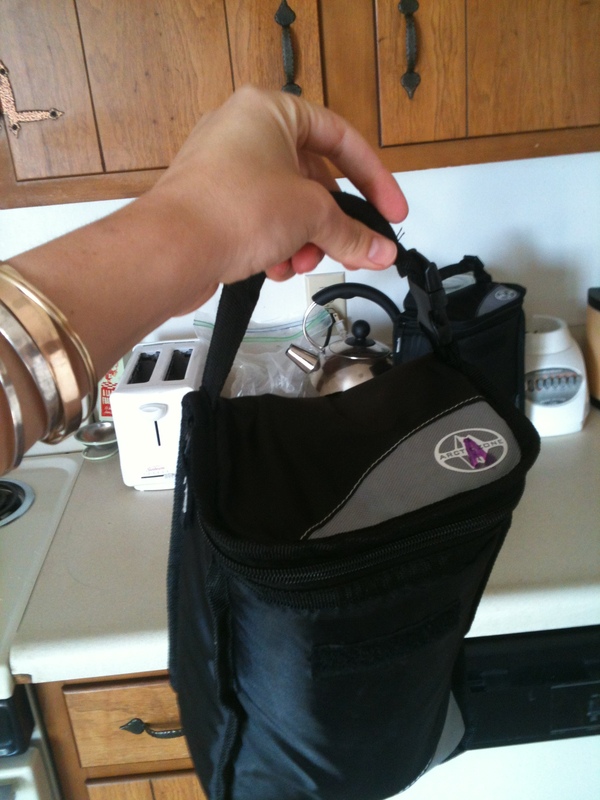 – Lunch box/ bag keeps things cold or hot and easy to carry. 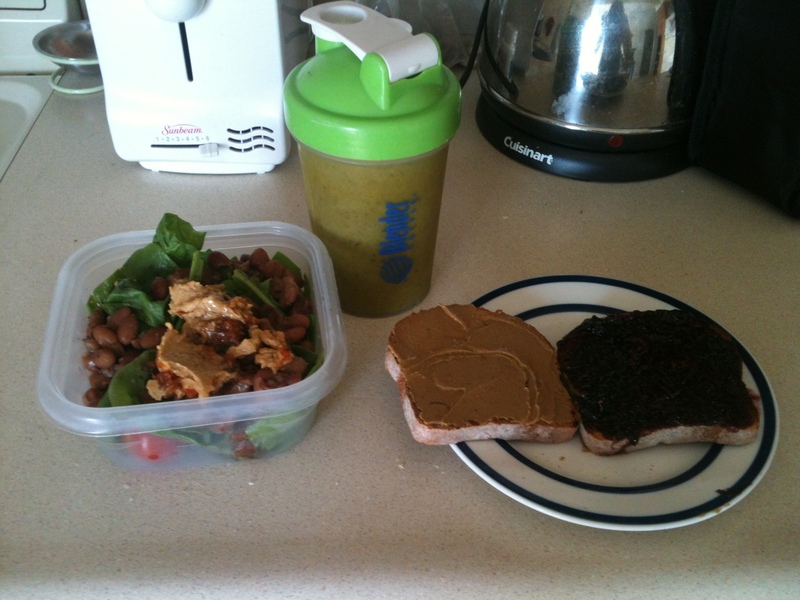 ^ My handy dandy lunch box. I was full and happy with my lunch and this morning, as a treat for resisting for 5 days, I had a giant pancake breakfast! Enjoy your Sundays. Don’t forget to smile! 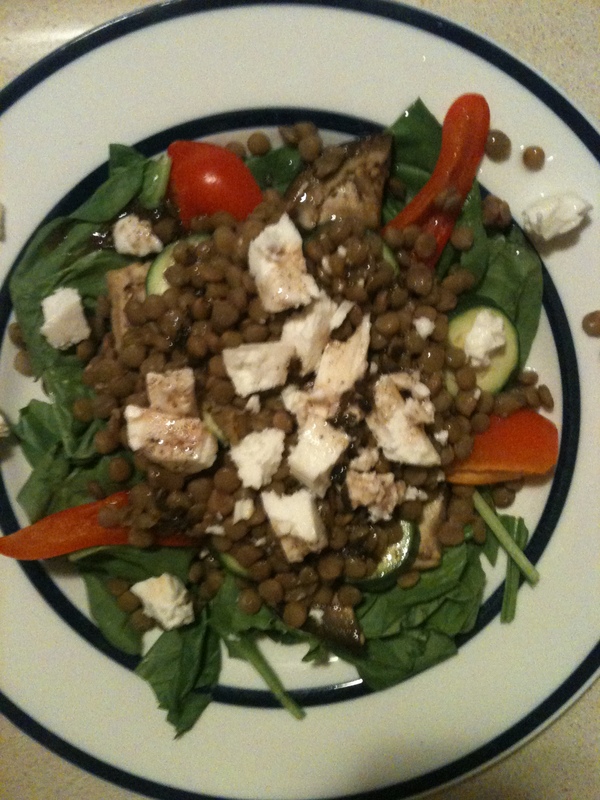 This entry was posted in Inspiration, Nutrition, Recipes and tagged celiacs, cheap, food, friends, fun, gluten, gluten free, happy, health, inspiration, life, lunch, nutrition, recipe, routine, sack lunch on September 16, 2012 by ahappylass. I am definitely not the healthiest person I know but I am towards the top of the list. One of the ways I make sure that I never fall back into bad habits is that I’m always working on something. Always taking baby steps. My current baby step: more carbs for lunch, less for dinner. The theory is that I will actually use the energy they give me if I eat them for lunch but at night, they just sit in my stomach, converting to sugar then fat. 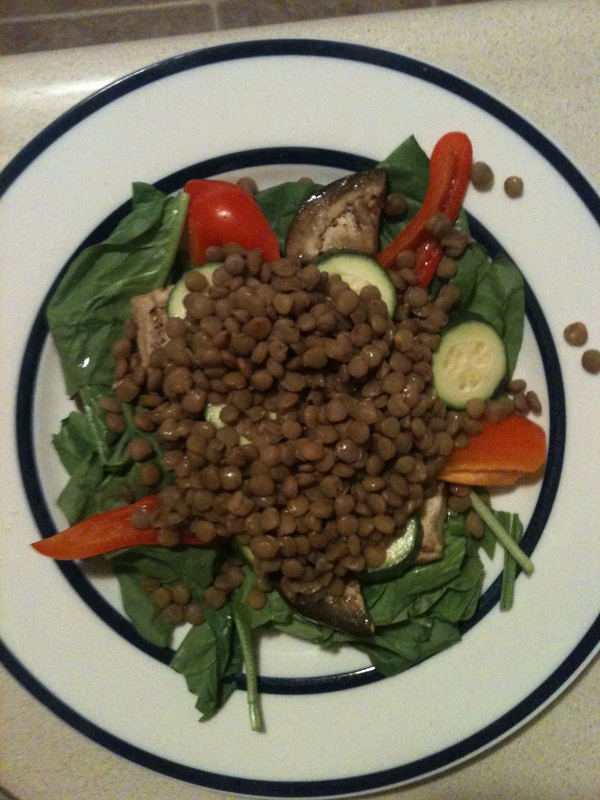 So I cooked this recipe to take to work for lunch and I had a salad for dinner! My dessert plate had some sugar in it but that’s the next step I’ll be embarking on. This recipe is awesome because it has some grain but it’s also full of protein, nutrients from the produce, and good fat. 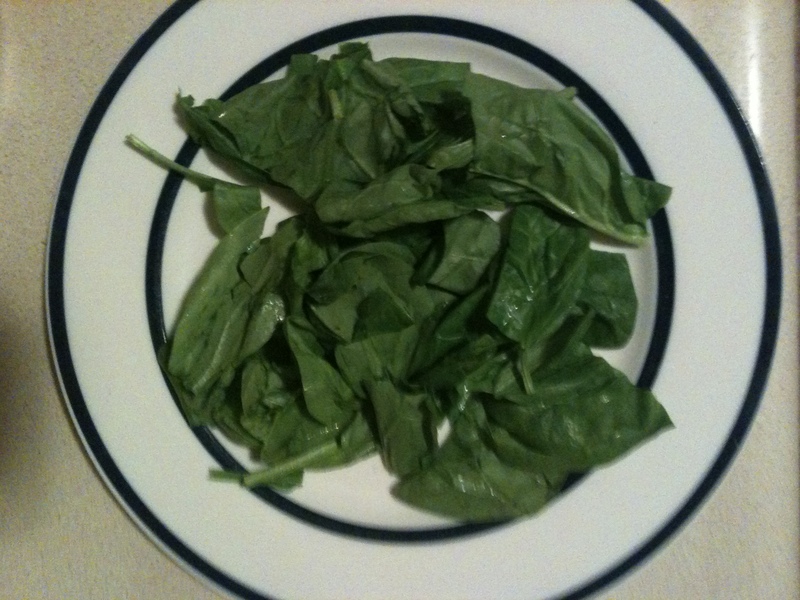 *note: the less you cook the vegetables in the beginning, the more nutrients stay in them. Its gluten-free, dairy free, and sugar-free (yet tasty?). And it’s so QUICK AND EASY! ^ Preheat the skillet on medium heat, grease with high heat oil. 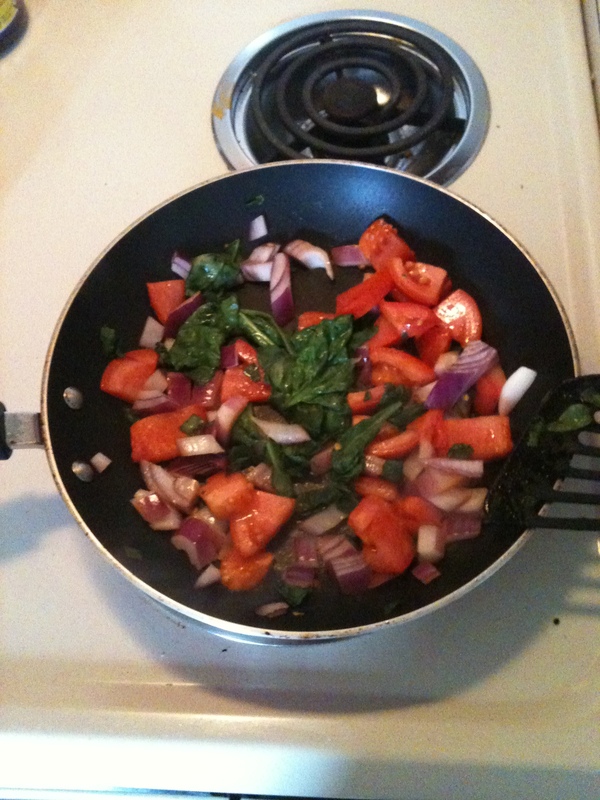 Add chopped produce and saute until only slightly crunchy (my spinach had wilted). 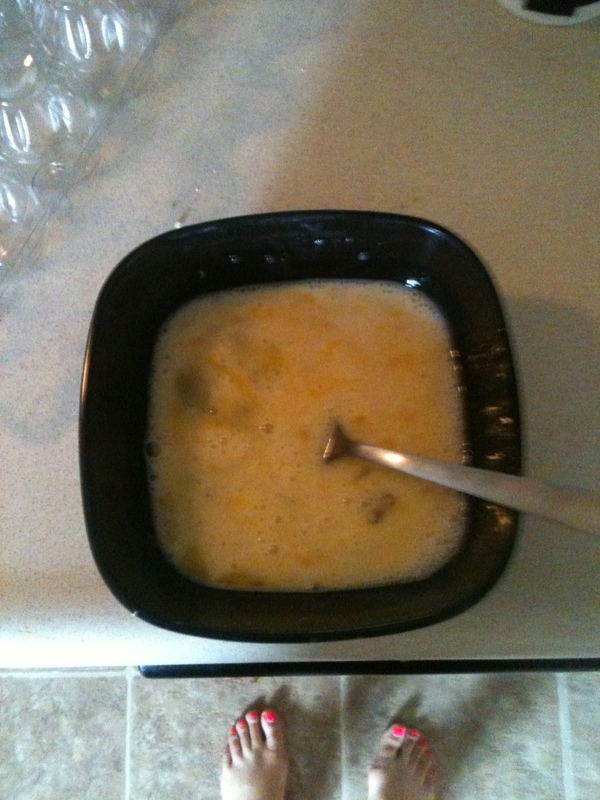 ^ While its cooking scramble the eggs with the milk. 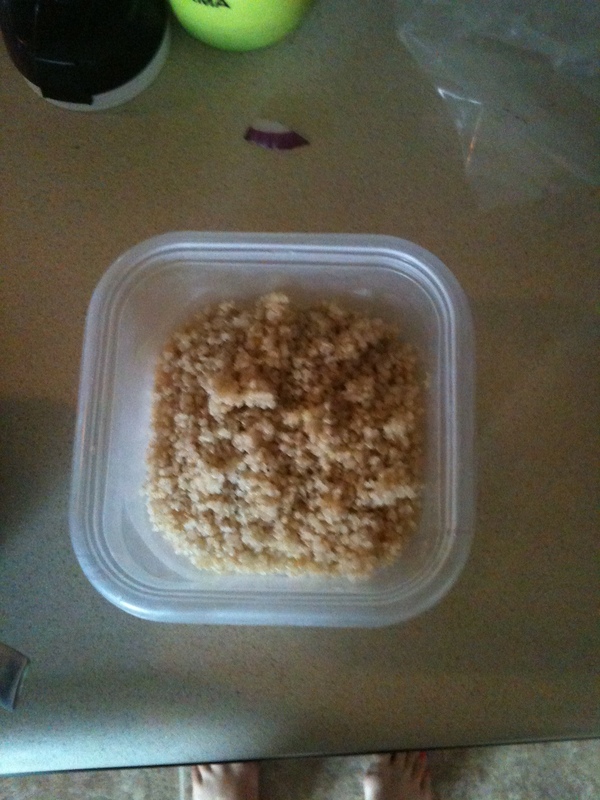 ^ and prep the quinoa in Tupperwear so you can take it with you. 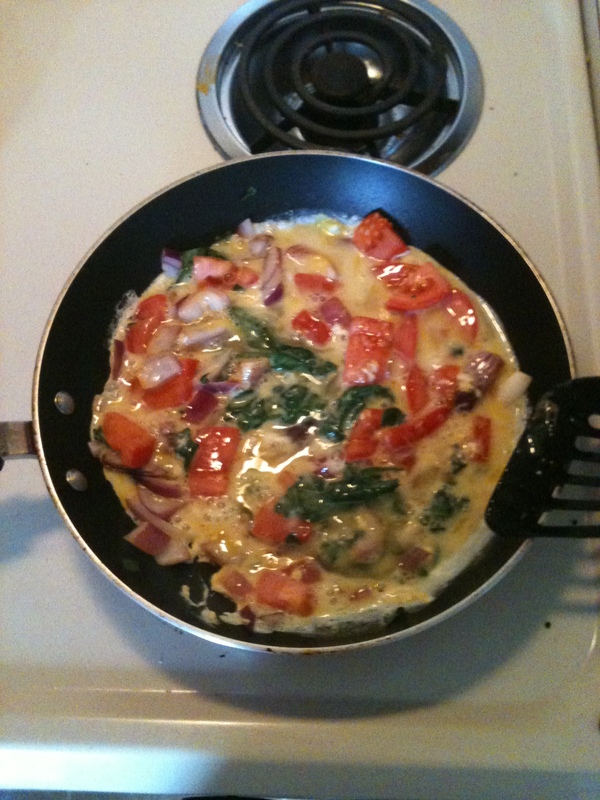 ^ Add the eggs to the pan and scramble them all up. Cook until the eggs are done. ^ and plate it! Sprinkle with some salt and pepper then cover it immediately to keep moisture and heat in. 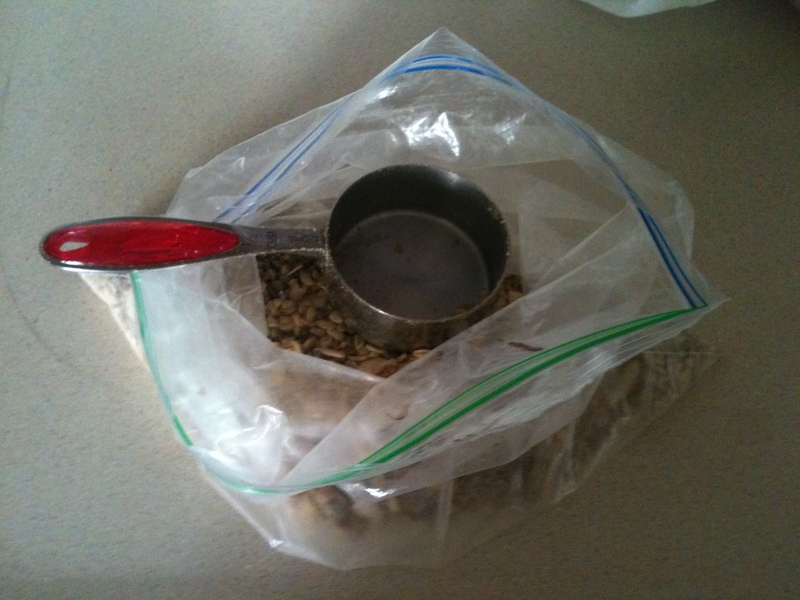 If you put it in an insulated lunch bag like I have, you shouldn’t need to reheat it. 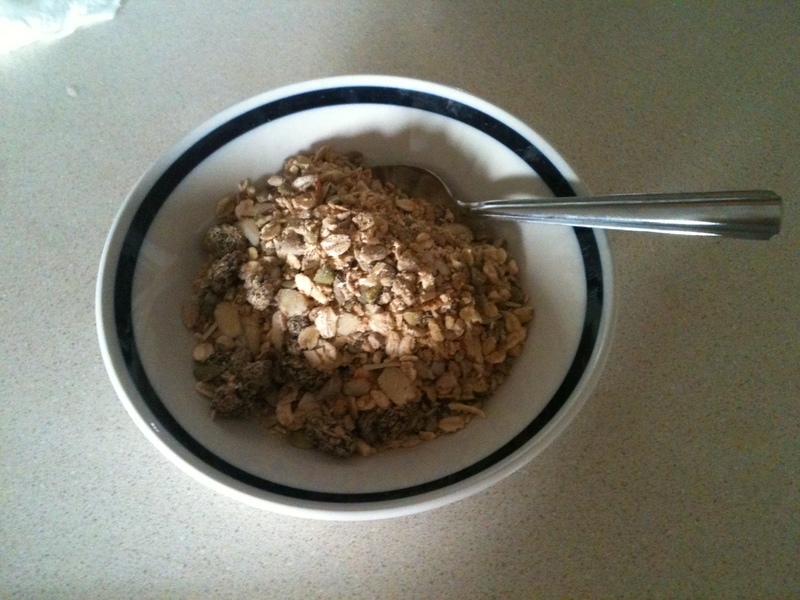 This entry was posted in Nutrition, Recipes and tagged bag lunch, celiacs, dairy free, food, gluten, gluten free, health, inspiration, lactose free, lunch, nutrition, recipe, sugar free on September 6, 2012 by ahappylass.